Mumbai: Facing employee resistance, Jet Airways (India) Ltd is mulling withdrawing a plan to cut 2009 wages for those employees whose gross salary was at least Rs75,000 a month, three top executives familiar with the development said. A section of pilots, engineers and senior management has said they are unwilling to accept a pay cut, a senior Jet Airways official said. Representatives of Jet’s cabin crew have also approached the management asking that allowances shouldn’t be cut against a backdrop of the airline reducing its flights, said another executive who is familiar with the development. 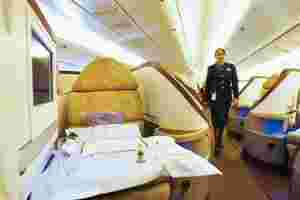 Cabin crew are paid allowances based on flying hours. Ragini Chopra, a spokeswoman for Jet, said employees had volunteered to take a pay cut. “Over 50% of the employees have positively reacted to the proposal," she claimed. “I cannot comment or disclose the details of this pay cut proposal since it is purely an internal matter." An email sent to Jet on Monday with additional questions went unanswered. Naresh Goyal, founder-chairman of Jet, had said in a letter to employees earlier this month that the airline’s top management had already volunteered a 25% cut in salary. He also suggested a combination of wage and allowance cuts for pilots to bring their remuneration in line with other employees. “It is up to (the) chairman to take (a) call on the suggested wage cuts as pilots are not co-operating to his request," said another Jet Airways executive, who also did not want to be identified. “There is no point in wage cuts if pilots are not willing to do that. Because over 80% of the savings from this pay cut should come from pilots, who draw heavy salaries." The Society for Welfare of Indian Pilots, an association of pilots with Jet, is in negotiations with the company management over the issue. Mint could not ascertain the number of Jet employee strength who earn Rs75,000 a month. Jet’s total employees rose some19% to 13,163 in March from the year-ago period and total employee costs rose 28.5% to Rs1,205.2 crore, much of it because of expansion. Vijay Nara, an aviation analyst at brokerage Centrum Broking Pvt. Ltd, had previously estimated Jet’s wages proposal would only result in 10% savings on total employee costs. India’s airlines have resorted to a series of cost cutting measures as they are expecting a combined loss of $2 billion (Rs9,460 crore) in fiscal 2009 due to higher jet fuel costs and overcapacity. Jet’s rival Kingfisher Airlines Ltd recently rationalised salaries of pilots by migrating to a remuneration structure linked to flying hours in a bid to cut costs. “We have introduced productivity-linked remuneration in line with international practices," said a senior Kingfisher Airlines executive who didn’t want to be named. “... Deccan Aviation (which it acquired) had this structure and we are putting Kingfisher Airlines’ pilots in that structure."